Wyoming may be the least populous state in the U.S., but it is also home to some of the most beautiful landscapes and sights in the country, like Yellowstone National Park in the northwest, the nearby Grand Tetons National Park, and Devil’s Tower to the east. The cowboy culture of the Old West still lingers in Wyoming, so visitors will find many attractions and historical sites related to the western heritage of the state. The small population of Wyoming means there are few public transportation options, so plan ahead before traveling in and around the Cowboy State. For more information, browse the guide below or visit wyomingtourism.org. Cody, Wyoming. Photo by Paul Hermans. The Buffalo Bill Historical Center in Cody is named for the famous Buffalo Bill, a frontiersman and American icon. But, it also contains information about cowboys, pioneer life, Plains Indians, ranching, art and the natural history of Wyoming. Lectures, films, educational programs and special events also take place at the history center throughout the year. The Jackson Hole Museum focuses on the history of the town and the personal stories of those who have settled there. The museum and Jackson Hole Historical Society also offer public programs and free summer walking tours. The Museum of the American West in Lander looks at the different groups who lived in Wyoming, including pioneers, ranchers and Plains Indians. Visit the Pioneer Village or view exhibits about the cultural history of central Wyoming. The Nelson Museum of the West in Cheyenne contains a collection of exhibits, artifacts and art, including military artifacts, Native American art, cowboy artifacts and much more. Old Trail Town at the Museum of the Old West in Cody brings visitors back to the 1890s and frontier life in Wyoming. 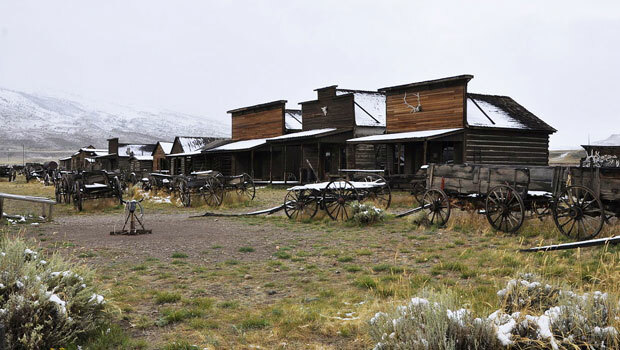 See original cabins and a saloon once used by the outlaw Butch Cassidy, Native American artifacts and other historical objects from the days of the Old West. See fossils, real dig sites and almost 30 skeletons at the Wyoming Dinosaur Center & Dig Sites in Thermopolis. Highlights of the dinosaur center include a triceratops (the state dinosaur of Wyoming), the 106-foot “Supersaurus,” named Jimbo, and the 35-foot T-Rex skeleton named Stan in the Hall of Dinosaurs. Visitors can also tour the dig sites during certain times of year. The Wyoming State Museum in Cheyenne teaches visitors about Wyoming history, including topics as varied as wildlife, dinosaurs and archaeology, Native Americans, art and the mining industry. The museum also offers programs, exhibits and events for children to teach them about history with interactive lessons and activities. Wyoming Territorial Prison State Historic Site in Laramie is a former prison that once held famous outlaw Butch Cassidy along with over 1,000 other prisoners in the 19th and 20th centuries. Take a guided tour from and learn about the convicts that were once held here and what life was like in the prison. Tours are offered between June and September. National Museum of Wildlife Art at Grand Teton National Park. Photo by Daniel Mayer. Go to a Thursday night “jam session” at the Occidental Hotel in Buffalo, WY and see local musicians play bluegrass, folk and western music for a free, public performance. Visiting musicians are also allowed to play with the band, if they can keep up! Browse the Arts Cheyenne website for the latest information on art and cultural events in the Cheyenne area. 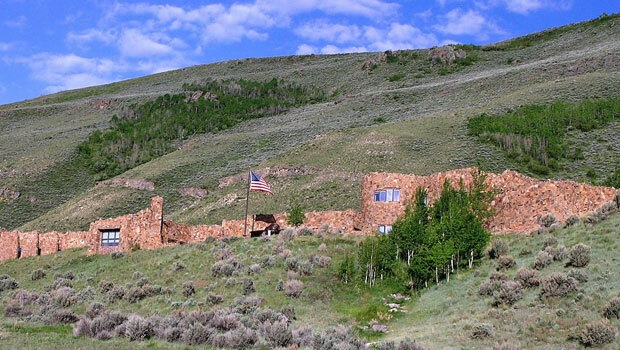 We’ve also put together a group of art museums, cultural centers and performing art venues in Wyoming. Yellowstone National Park stretches across Wyoming, Idaho and Montana, but the majority of the park is in Wyoming. The first national park in the U.S., and one of the most iconic national parks in the world, Yellowstone has many outdoor activities within its borders, including hiking, cycling, boating, camping, fishing, horseback riding, llama packing, cross-country skiing, snowmobiling and more. Ranger-led tours and hikes are also available at certain times of year. One of the park’s most famous attractions is the enormous geyser, Old Faithful. Visitors can see many other geysers throughout the park as well. Grand Teton National Park is located ten miles south of Yellowstone near Jackson, WY. Many outdoor activities are available to visitors in Grand Teton, including biking, mountain climbing, hiking, cross-country skiing, snowshoeing, boating and camping. Ranger programs are also available in all seasons, including wildlife viewing, guided hikes and campfire talks. Bighorn Canyon National Recreation Area on the border of Wyoming and Montana offers many opportunities for outdoor recreation and activities, including the 71-mile Bighorn Lake, the Bighorn River, historic ranches and sights like Bighorn sheep and the largest herd of wild horses in the United States. Camping, sailing, kayaking, canoeing, fishing, hunting, hiking and ranch tours are potential outdoor activities for visitors to Bighorn Canyon. Bighorn National Forest in north-central Wyoming features 1,500 miles of trails, campgrounds, lakes, mountains and places like Shell Falls and Cloud Peak Wilderness. Hiking, camping, fishing, kayaking, canoeing, and winter sports like skiing, snowshoeing, snowmobiling and cross-country skiing are some of the many outdoor activities at Bighorn National Forest. Devil’s Tower National Monument is a prominent rock formation and a sacred site for local Native American tribes in the Black Hills of northeastern Wyoming. Hiking is a popular activity at the park, including a hike that circles around the tower. Climbing is allowed but all climbers must register before climbing the tower. See a list of climbing guides that offer rock climbing tours at Devil’s Tower. Horseback riding, cross-country skiing and snowshoeing are also available at the monument. National Elk Refuge is a protected area for a herd of Jackson Elk, bighorn sheep, bison, pronghorn sheep and other types of wildlife. Visitors can see the elk herd on winter sleigh rides, participate in the Elkfest and Antler Auction, view wildlife throughout the year and see the historic Miller Ranch in the summer. Limited hiking is also available. There are many places to ski and snowboard in the Jackson area, often called Jackson Hole, including Jackson Hole Mountain Resort, Snow King Resort and Grand Targhee Resort. Skiing areas in other areas of Wyoming include Sleeping Giant Ski Area, near Cody, Snowy Range Ski Area, near Laramie, Hogadon Ski Area in Casper and White Pine Ski, near Pinedale. 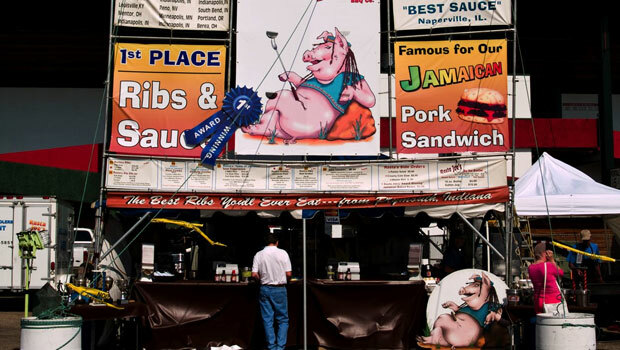 Ribfest at Frontier Park. Photo by Larry Jacobsen. Wyoming cuisine is influenced by cowboy and ranching culture and Native American cuisine, so international visitors will find dishes like fry bread, fresh fish, chili, beans and plenty of meat-based dishes, including bison, elk and lamb. Find a local farmers’ market in Wyoming to buy fresh fruit, vegetables and handmade products and baked goods. The Jackson Hole Mountain Festival features many activities, including sports competition, live music, free concerts, fireworks and other fun events. The festival takes place in March in Teton Village near Jackson. Flaming Gorge Days is a summer celebration featuring the Festival in the Park, a parade and two nights of concerts with country and rock music. The event is held over three days each June in Green River in southwest Wyoming. Powwows are common cultural events in Wyoming that celebrate Native American heritage with traditional dancing, music, food, arts, crafts and other activities. The Eastern Shoshone Indian Days powwow during the last weekend in June is the largest powwow in Wyoming. Cheyenne Frontier Days celebrates Western heritage with an outdoor rodeo and events and activities like concerts, a carnival, a parade, a Native American Village, food events, cooking competitions and events at the Old West Museum. Frontier Days is the largest event in Wyoming and one of the largest rodeos in the country, attracting approximately 200,000 people each July. The Grand Teton Music Festival is a classical music festival in Jackson Hole that includes both a summer season and winter concerts. Orchestras and musicians from around the United States travel to Wyoming to perform at the festival, which lasts for several weeks. Fort Bridger Rendezvous is an annual “mountain man rendezvous” and one of the largest events in Wyoming. A mountain man rendezvous refers to an old tradition when fur trappers, mountain men and Native Americans would meet up in the wilderness to sell their furs, get supplies, socialize and show off their skills. Today, modern traders sell their products and visitors can see traditional dances and musicians, eat foods like kettle corn and fry bread, take classes on traditional crafts, and learn about the history and culture of the 19th and 20th century in Wyoming. The event takes place over Labor Day weekend in September. As the least populous state in the United States, Wyoming has a limited number of public transportation resources. START Bus - Jackson and to nearby areas in Teton Village, Star Valley and Teton Valley in Idaho. There are no Amtrak trains or other national passenger trains operating in Wyoming. Serve Wyoming works to connect organizations with volunteers looking to help in their local community. Browse the Serve Wyoming website to find a volunteer opportunity based on your interests, location and time availability. Contact a local food pantry in Wyoming to sign up as a volunteer and help feed the hungry. Volunteers can help with tasks like sorting donations, preparing and serving meals and helping with administrative work. Habitat for Humanity works with volunteers to build and renovate low-cost housing for families and individuals in need. Volunteers need little to no experience to help, and both groups and individuals are welcome to help. Contact a local Habitat affiliate in Wyoming to learn more.